James Gulliver Hancock's "All the Buildings in New York" is a daunting art project. A drawing of Mott Street in Manhattan. James Gulliver Hancock is attempting to draw every building in New York City. Some people see New York as just a city. For Brooklyn artist James Gulliver Hancock, it's a muse. For the past year, Hancock has been drawing the city's buildings, and his goal is to draw every single one. His project is called "All the Buildings in New York." 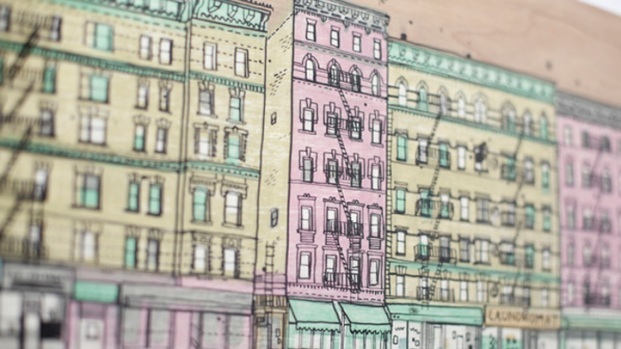 He makes his way through the streets of New York, sketching buildings as he goes, and then takes those sketches home and turns them into finished pieces. The project started one day in his Greenpoint studio, where he began to sketch the townhouse across the street. From there, he moved on to Williamsburg, and started drawing the Manhattan skyline from the waterfront. "It stopped being an art project and started being a daily religion," Hancock says. Originally from Australia, Hancock has bounced around the globe, from Sydney to London to Los Angeles. In each city he finds one element to focus on. In Los Angeles, it was the cars. In London, a more conceptual approach: raindrops. Hancock says focusing on just one aspect of a city helps him gain a better sense of understanding about where he lives. "As someone who was going to live here, I wanted a real experience," Hancock says. Since settling into his Carroll Gardens apartment a year ago, Hancock says he's drawn more than 500 individual buildings. He's visited every borough but Staten Island, though he did draw the Staten Island Ferry. Hancock describes his process as "pretty random." Sometimes he'll be sitting in a coffee shop looking out the window when the mood strikes him. At other times, he'll walk around the city looking for specific buildings and blocks to work on. According to the Building Department's website, there are more than 975,000 buildings and properties in the city. When asked about how realistic it is to document each one, Hancock says he prefers not to focus on it. "I don't like to think like that," Hancock says. "I like the naivete." The project has gained Hancock some measure of notoriety. Next month, he's hoping to showcase his work at a Lower East Side gallery, and he says he's even been in talks with publishers about collecting his paintings in book form. On his website you can find prints that start at $30; commissions can cost up to $900. After working on a recent commission -- Barneys New York at 660 Madison Ave. -- his latest piece focuses on the apartments of Bank Street in the West Village. While he says he wants to eventually interpret some of the city's most famous landmarks, he's in no rush. "It's about documenting the dailiness of New York," Hancock says. "How many people have drawn the Empire State Building?"